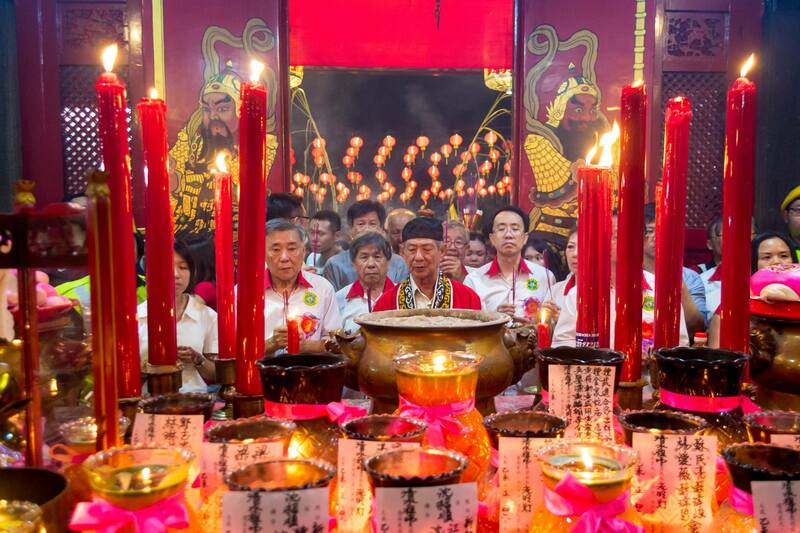 At 11.30 p.m. on the 5th day of the 1st lunar month, there is the usual “Chneah Hoay” ceremony by Cheng Hoe Seah to forecast the economy of Penang. 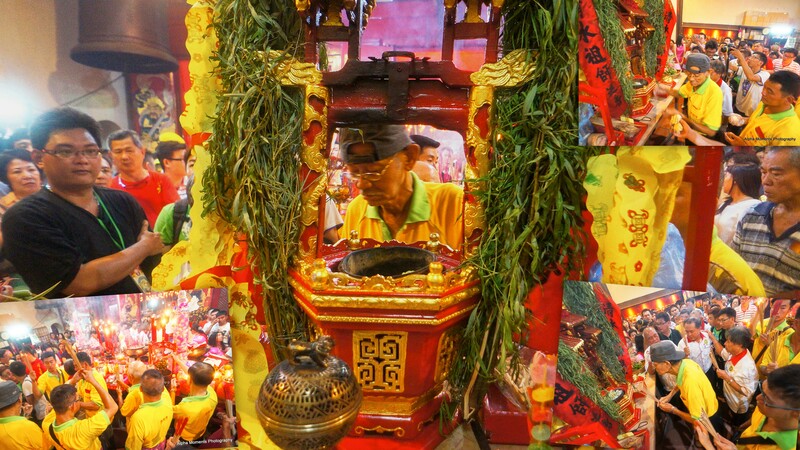 Usually the Main Hall of Snake Temple is so full of devotees that it is difficult for our photographers to take photos. 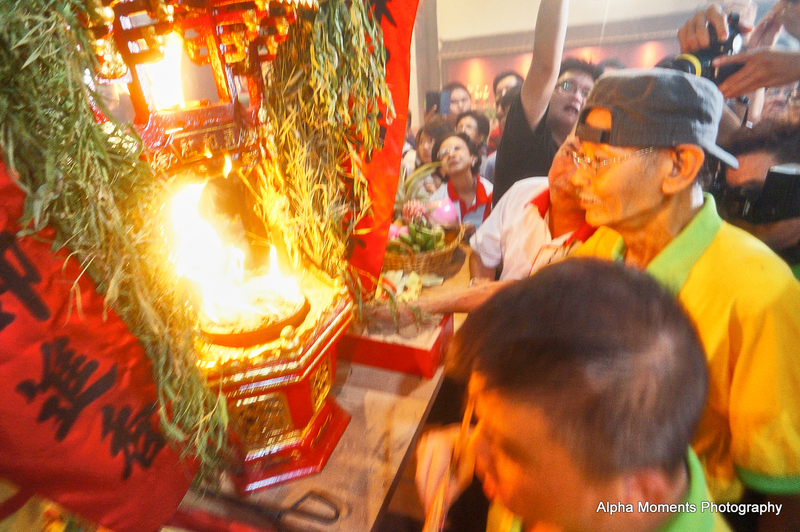 I received photos from Max Teoh Yeam Chuan (Alpha Moments Photography) and I was so impressed by the sequential photos he took of the “Chneah Hoay” Ceremony that I would like to share them with you. 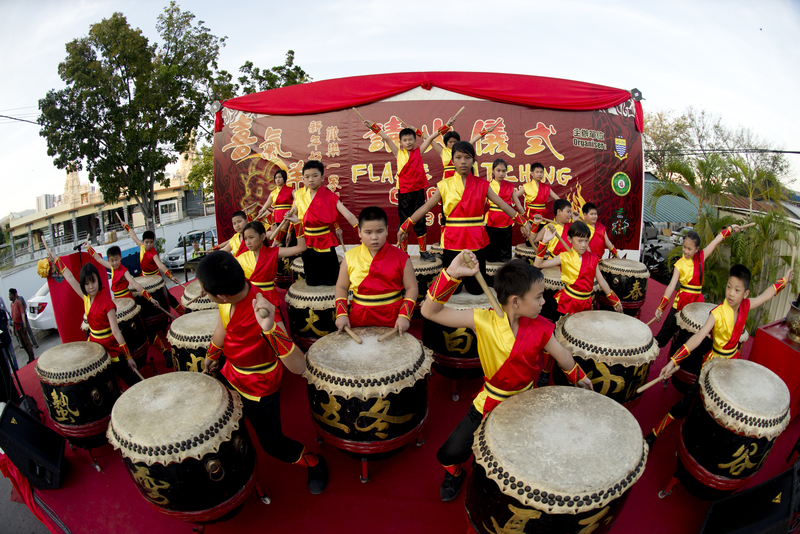 The other photos were taken by Michael Chuan. 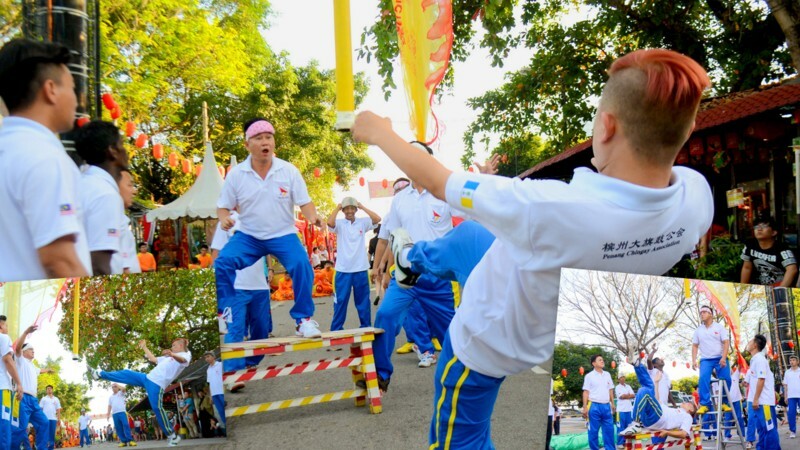 I think these are priceless photos and I am documenting them for posterity. 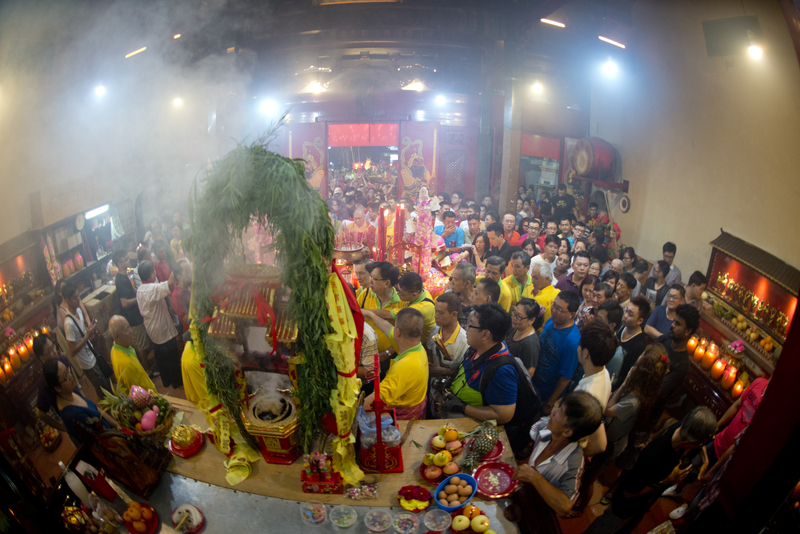 I have also added a sublime fish-eye shot taken by our Webmaster Peter Ho of the Main Hall of Snake Temple. 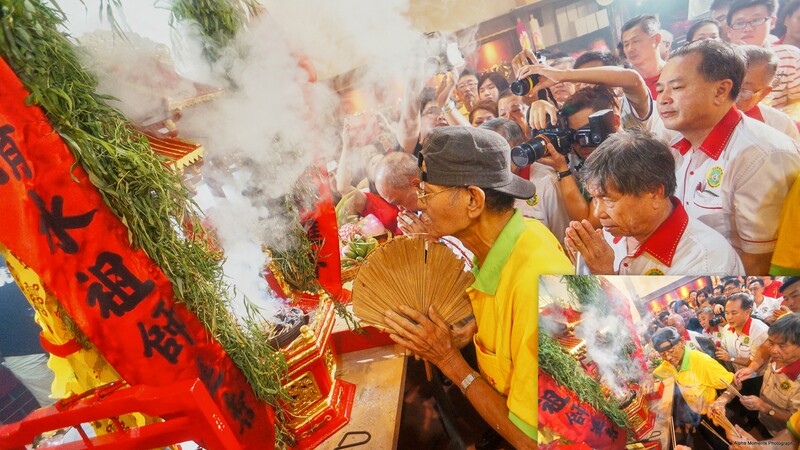 Prayers by Sai Kong Moh Eng before the “Chneah Hoay” Ceremony. 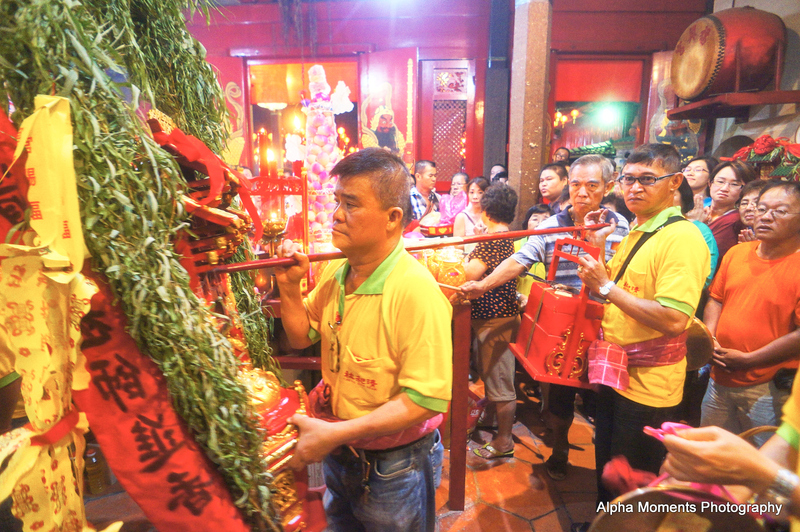 Cheng Hoe Seah members bringing in their urn for the “Chneah Hoay” Ceremony. 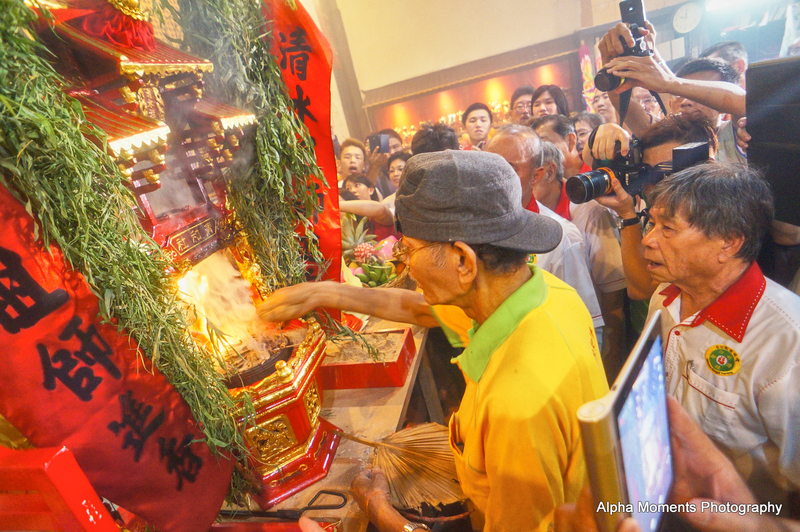 Mr. Yeoh Chin Eng of Cheng Hoe Seah preparing for the “Chneah Hoay” Ceremony while his fellow members prayed and assisted him. 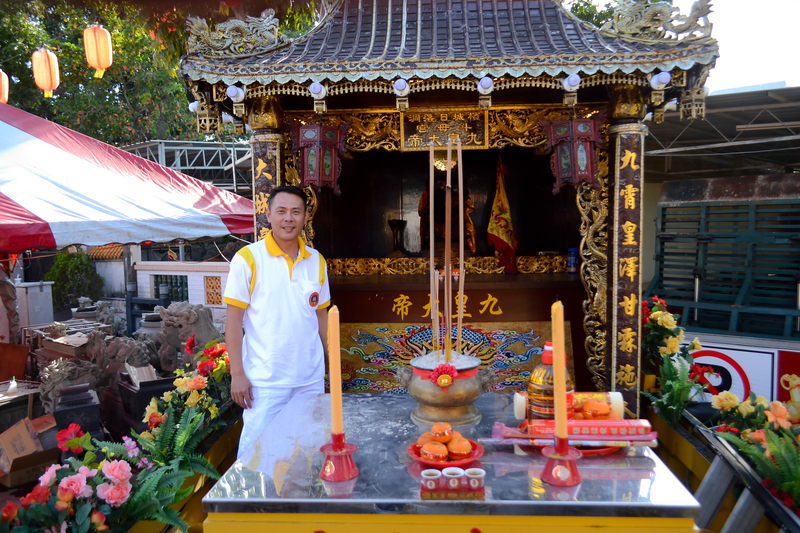 Y.B Danny Law praying at the start of the Flame Watching Ceremony and he was having fun recording it himself with his iPad (inset photo below). 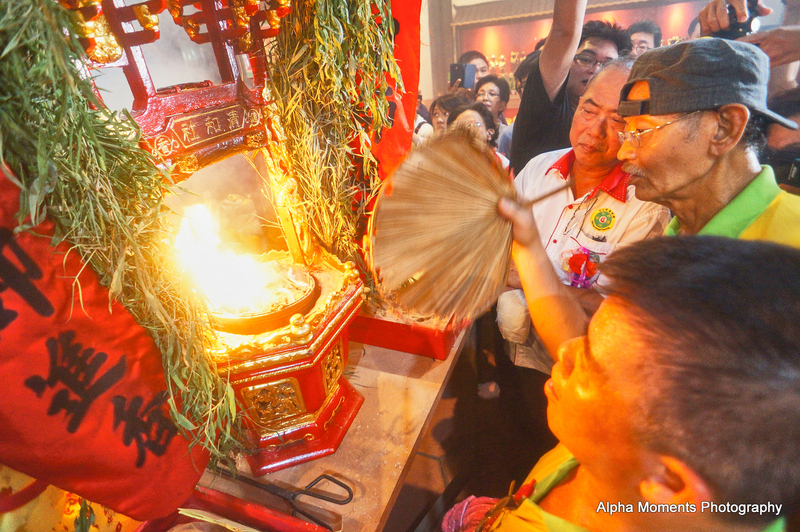 Fanning the flame by adding joss-sticks while Y.B. 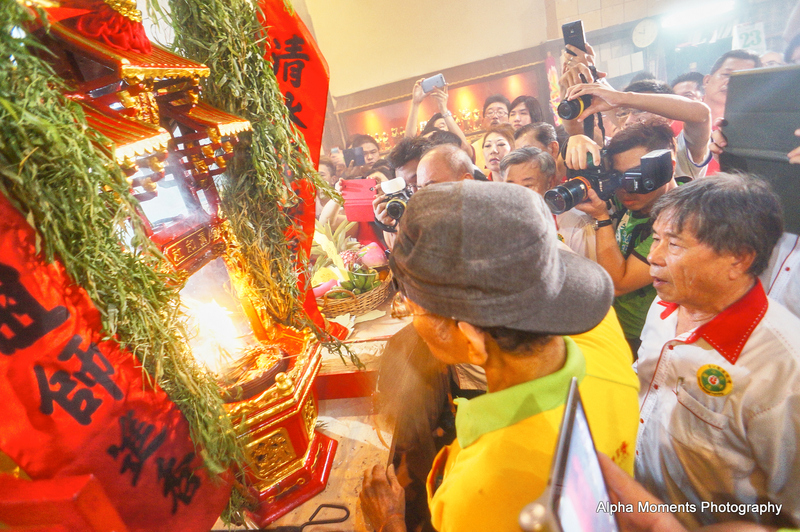 Danny Law and devotees watched with anticipation. 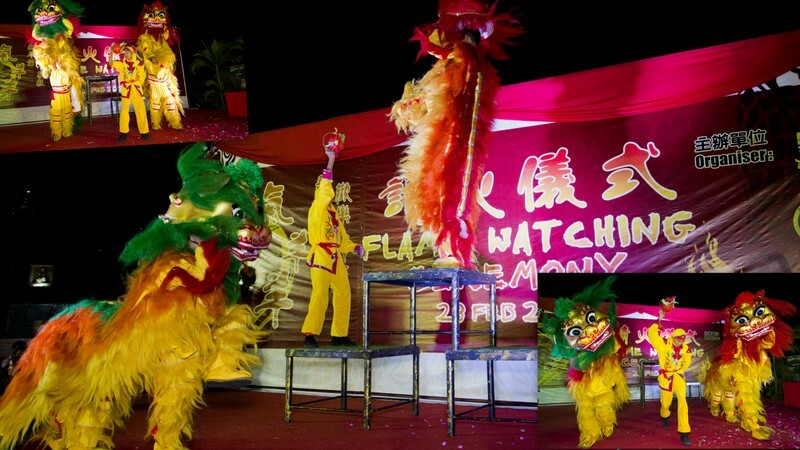 Watch – the flame just starting. 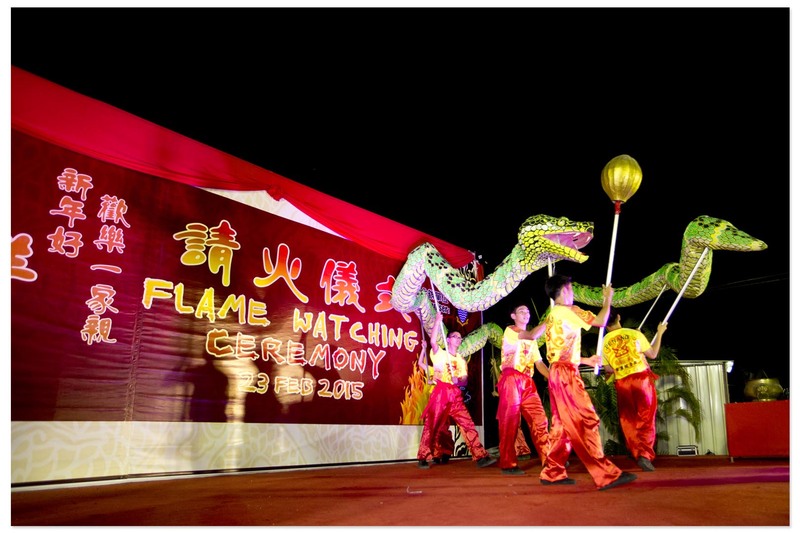 The above sequential photos taken by Max Teoh are priceless showing the flames for the 3 parts of 2015. 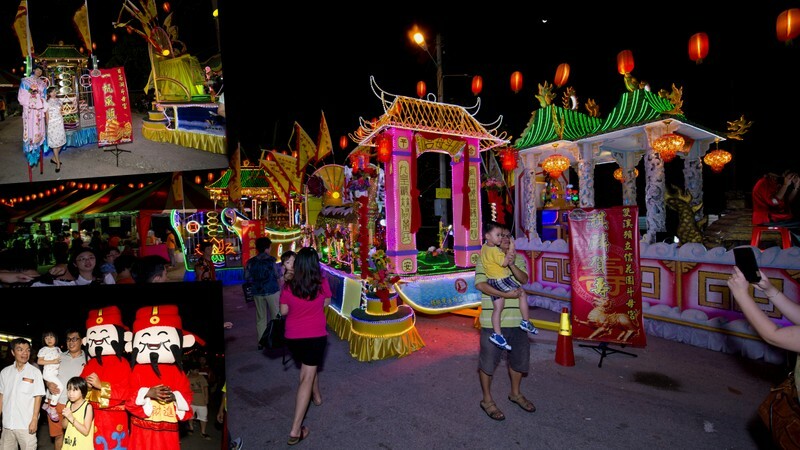 The prediction of the economy of Penang is Good for January-April, Normal for May-August and Very Good for September-December. Y.B. 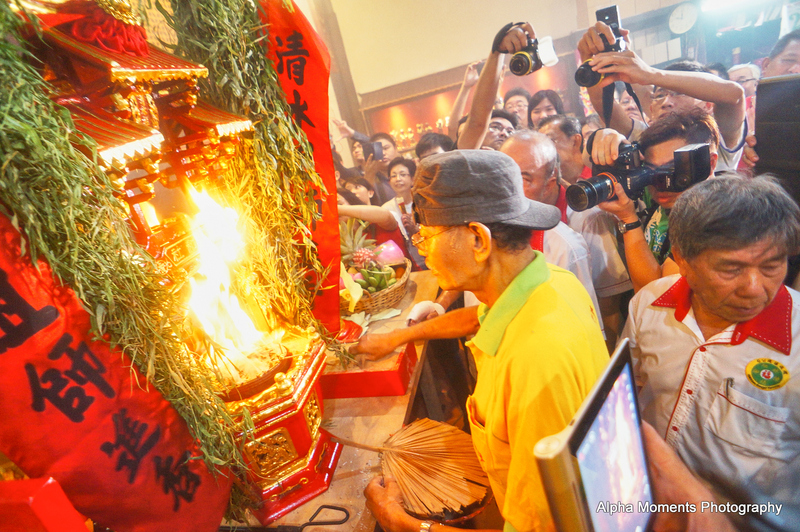 Danny Law seeking the blessing of Chor Soo Kong after the “Chneah Hoay” Ceremony. 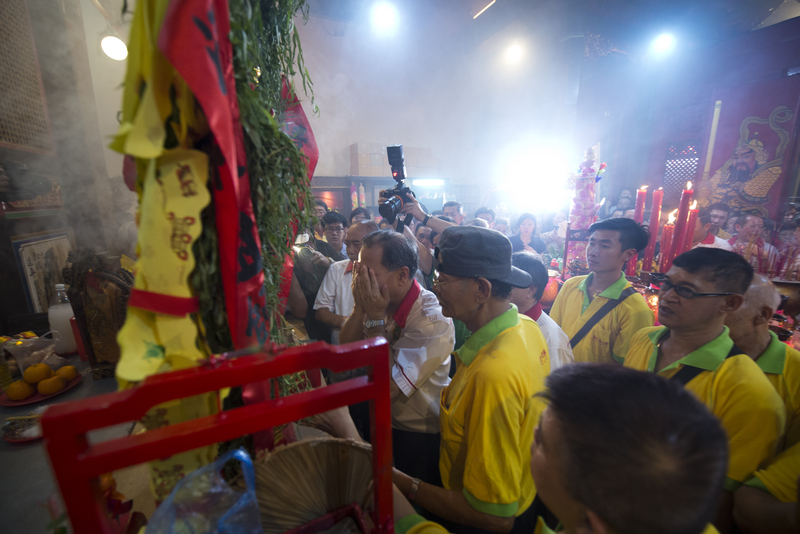 Mr. Cheah Cheng Ean, Chairman of Ban Ka Lan Organising Committee seeking blessing from Chor Soo Kong. 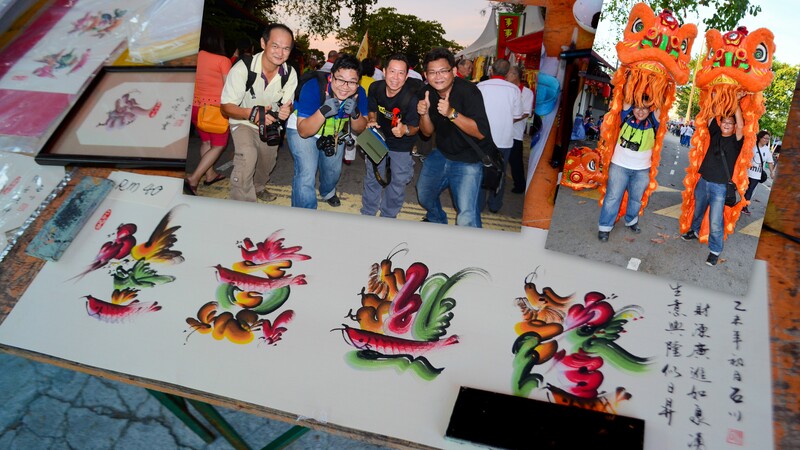 Inset photos Mr. Yeoh Seng Hoe (top left), Mr. Lim Poh Hock (bottom left) and Mr. Khoo Kay Hock (top right). 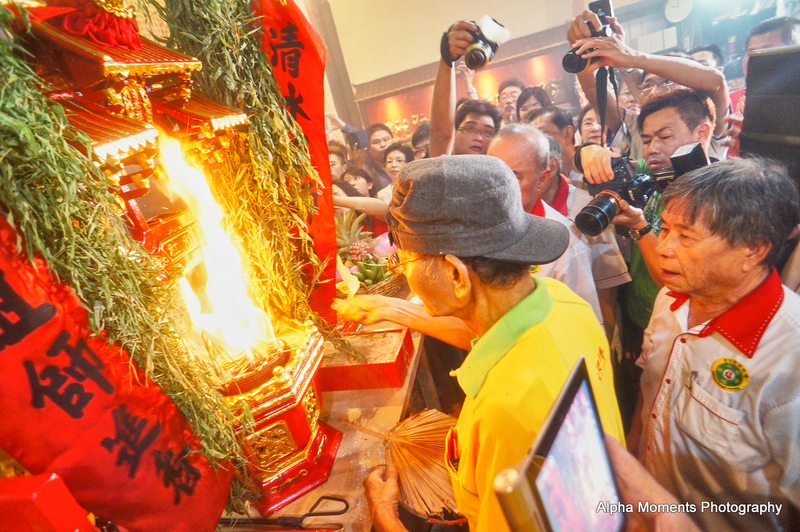 Dato’ Lim Hua Kwang (centre), Mr. Tan Joo Chye (bottom right) and family members of the Trustees of Hokkien Kongsi, Penang seeking the blessing of Chor Soo Kong. 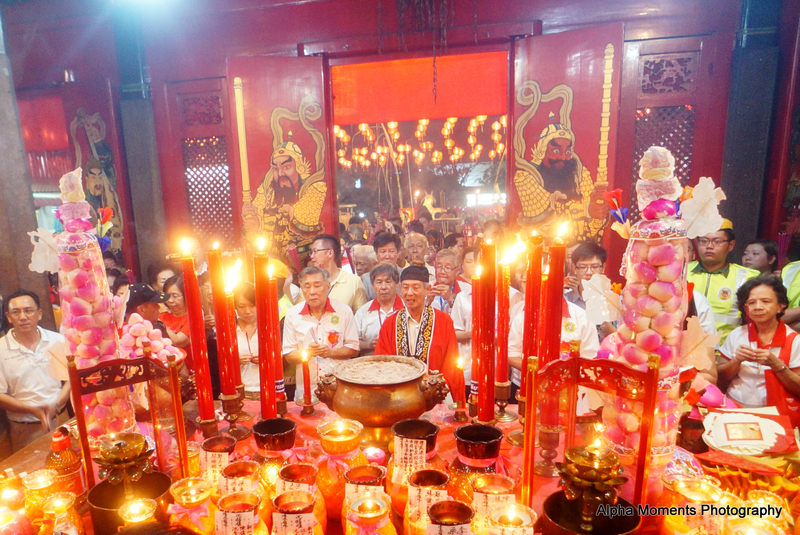 We will leave the Main Hall of Snake Temple with this beautiful photograph taken by our Webmaster, Peter Ho of the “Chneah Hoay” Ceremony. 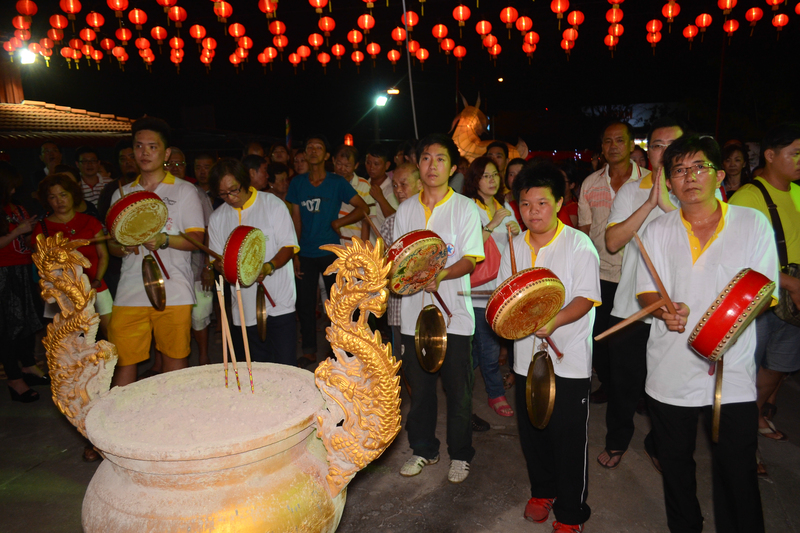 Members beating gongs and cymbals outside the Main Hall of Snake Temple during the “Chneah Hoay” Ceremony. 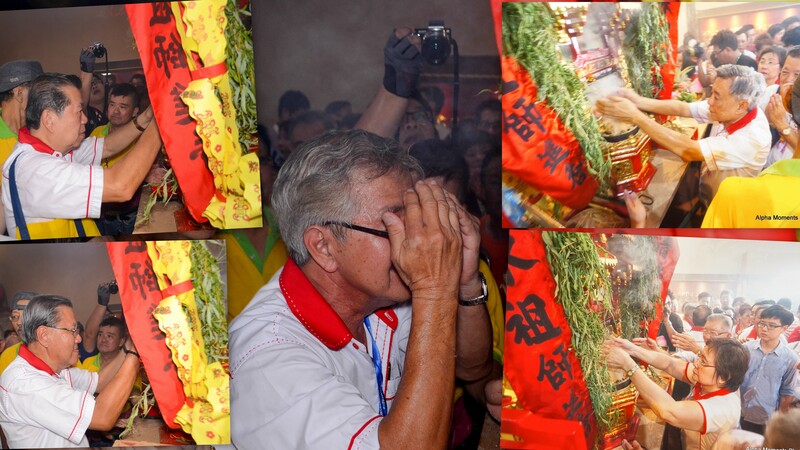 Thank you Peter Ho, Max Teoh and Michael Chuan for taking these wonderful photos in such crowded and smoky condition. 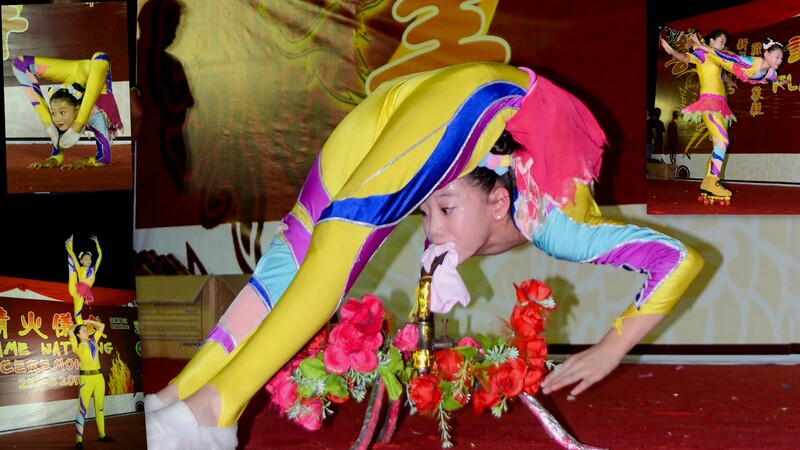 Certainly not an easy task at all. 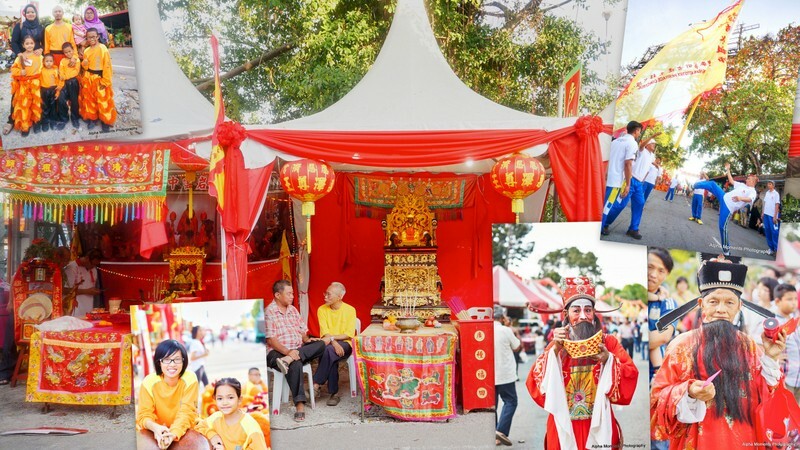 Once again Hokkien Kongsi, Penang organised Ban Ka Lan Festival 2015 in conjunction with the Penang State Government and it was held on the 5th day of the 1st lunar moon in the Chinese calendar (corresponding to 23rd February 2015). 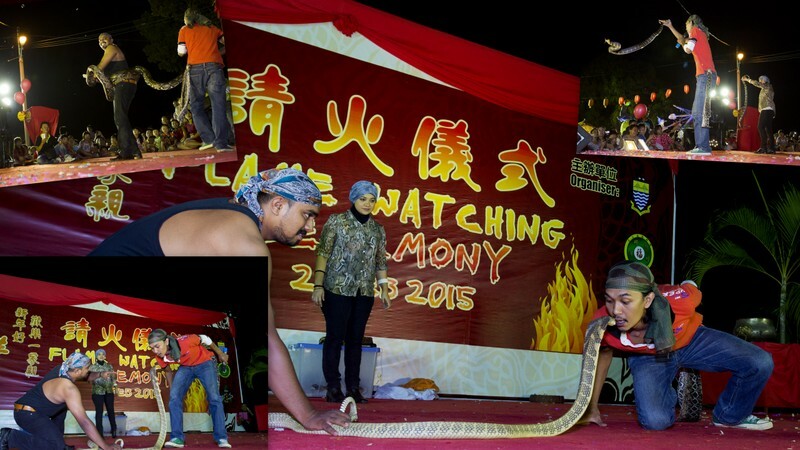 This event was sponsored by Y.A.B. 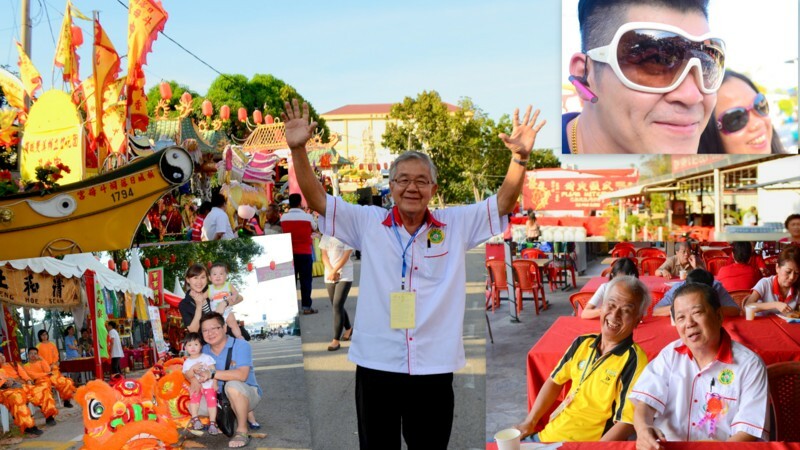 Tuan Lim Guan Eng (Rm30,000/-), Y.B. 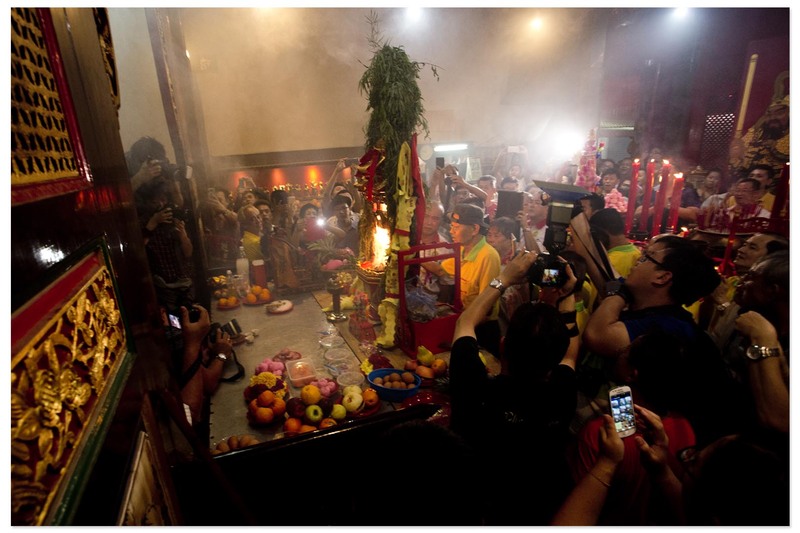 Danny Law (Rm20,000/-) with the balance by Hokkien Kongsi, Penang. 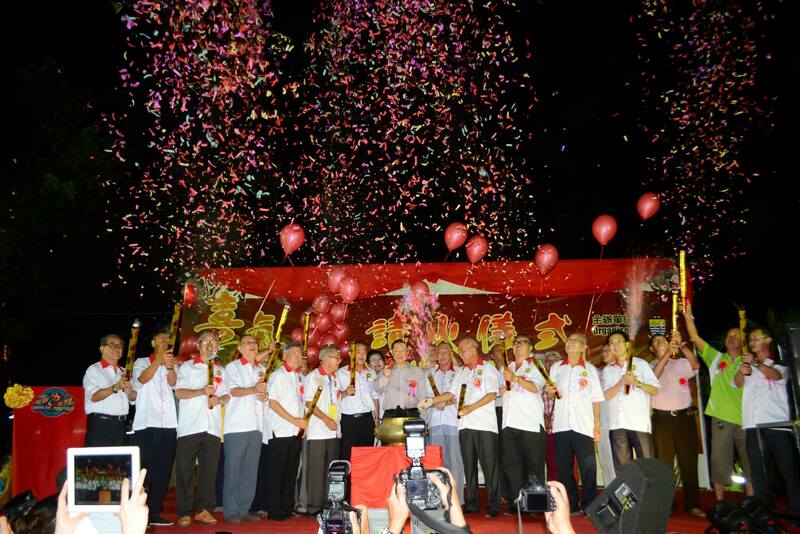 The Opening Ceremony was officiated by Y.A.B. 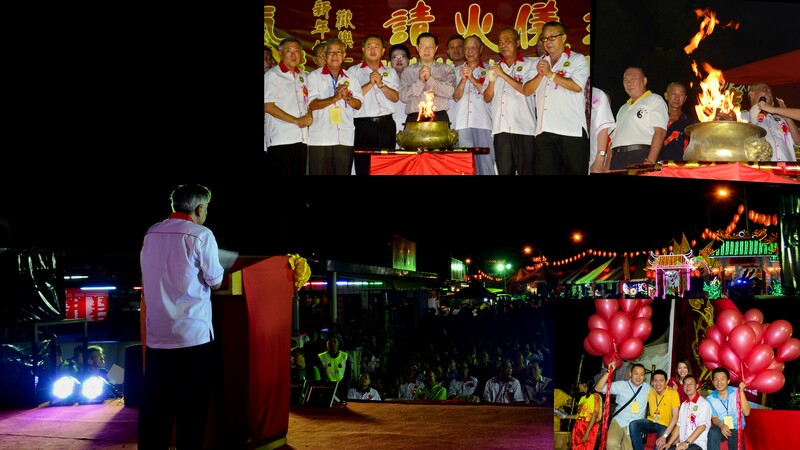 Tuan Lim Guan Eng and attended by Y.B. 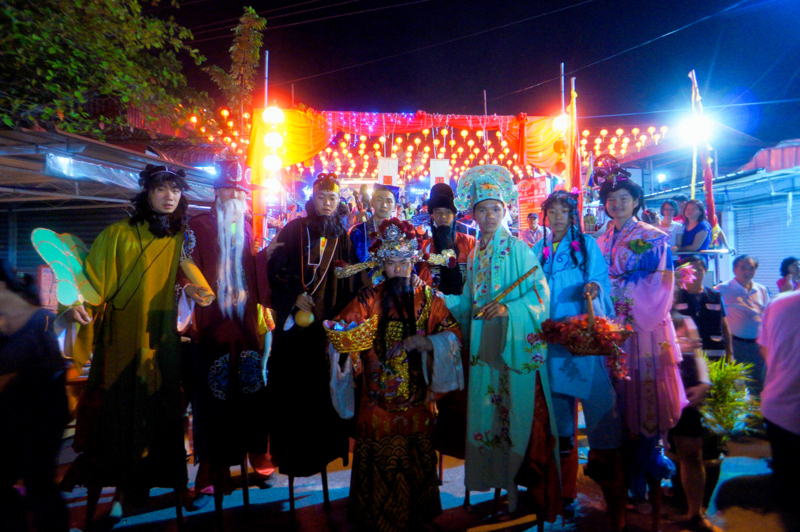 Danny Law, Trustees and wives of Hokkien Kongsi, Penang; invited guests and visitors to the Festival. 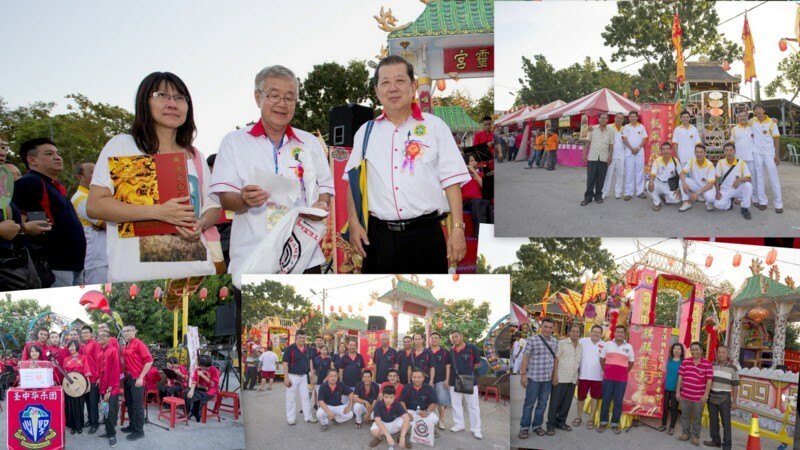 An interesting programme was lined up by the Organising Chairman, Mr. Cheah Cheng Ean and his Organising Committee for the entertainment of the guests and visitors. 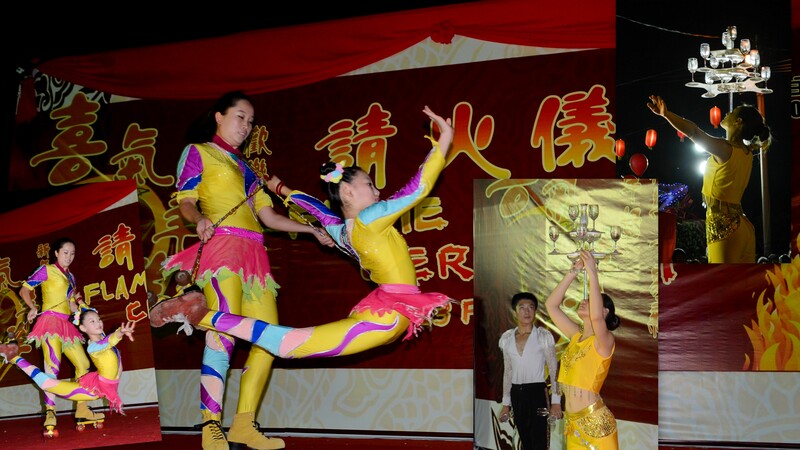 The main attraction of the evening was the Beijing Acrobatic Show. 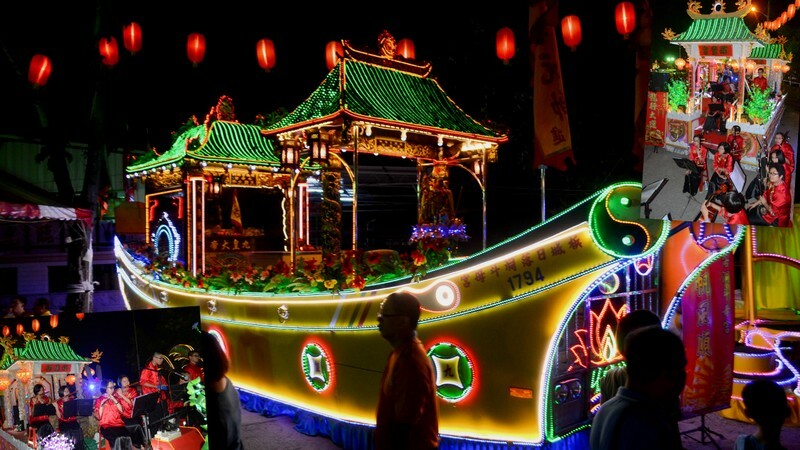 This article shows the official programme for the evening’s Festival with photos taken by Peter Ho, Chua Boon Keat, Michael Chuan and Max Teoh. 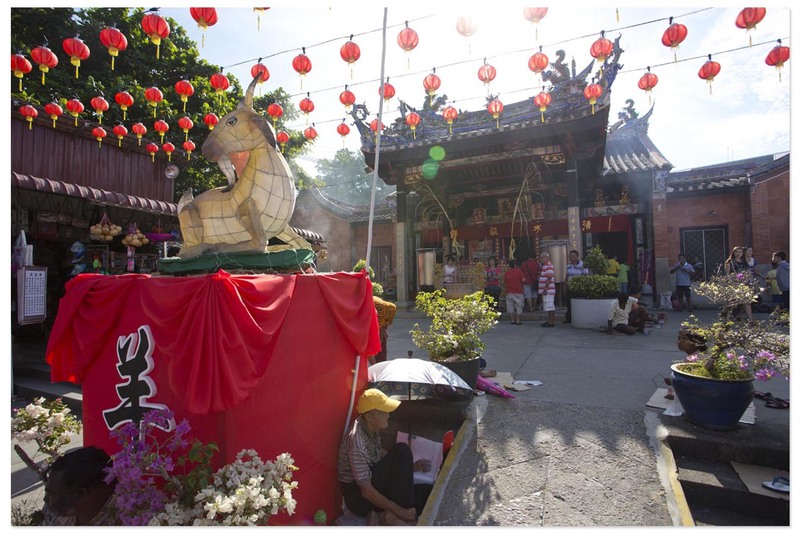 Snake Temple before 6 p.m. A quiet moment before the start of the evening’s Festival. 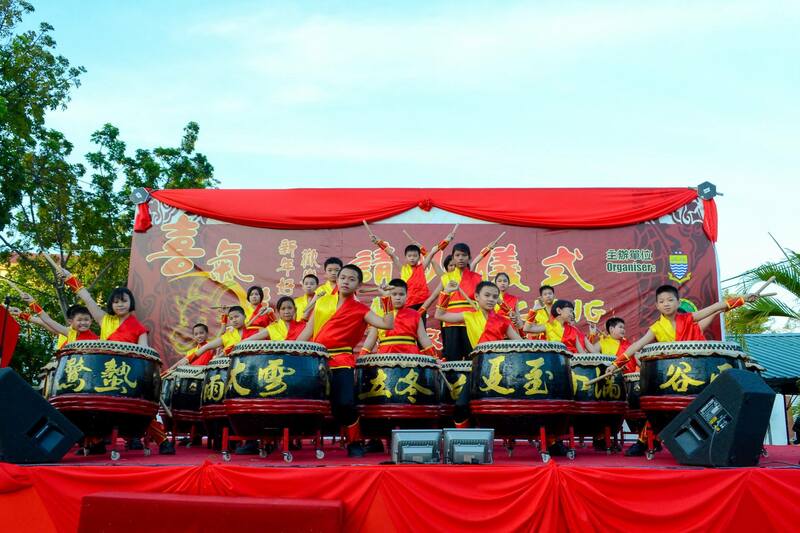 24 Drummers at the Stage preparing for the evening’s Festival. Y.B. 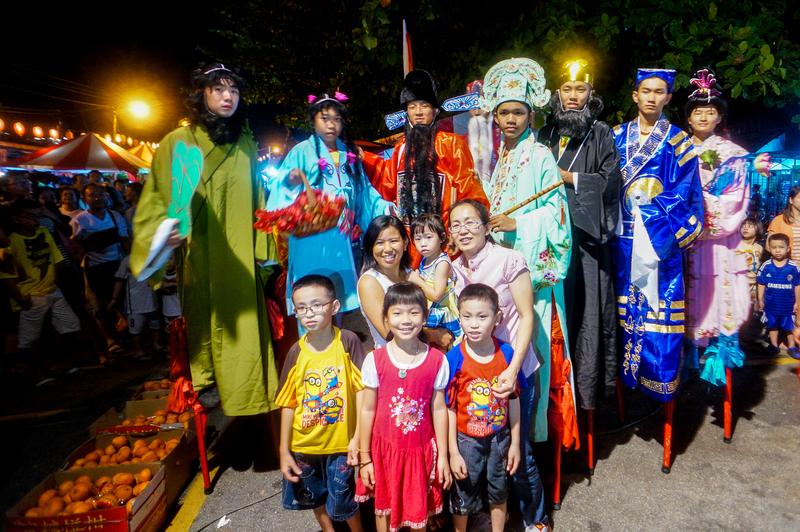 Danny Law Heng Kiang, Trustees of Hokkien Kongsi, Penang and friends wishing all at Ban Ka Lan Festival 2015 a Happy New Year. 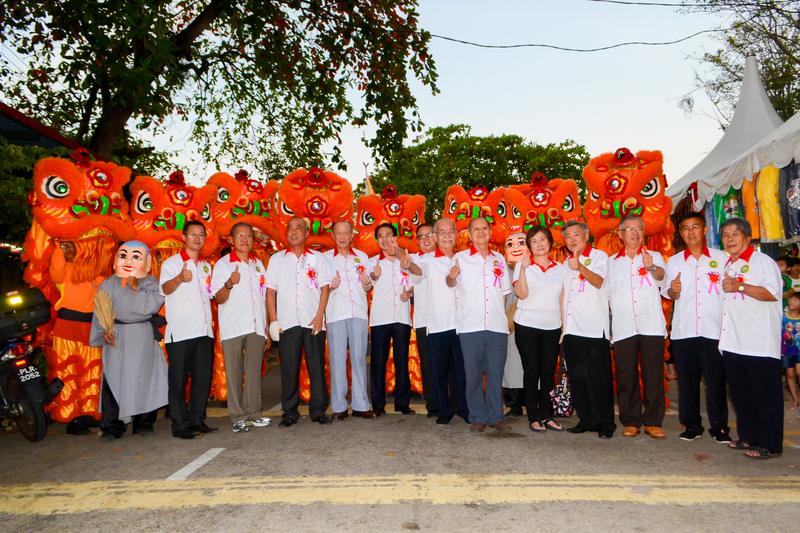 Trustees of Hokkien Kongsi, Penang and friends giving the thumbs-up to photographers while waiting for the arrival of Y.A.B. 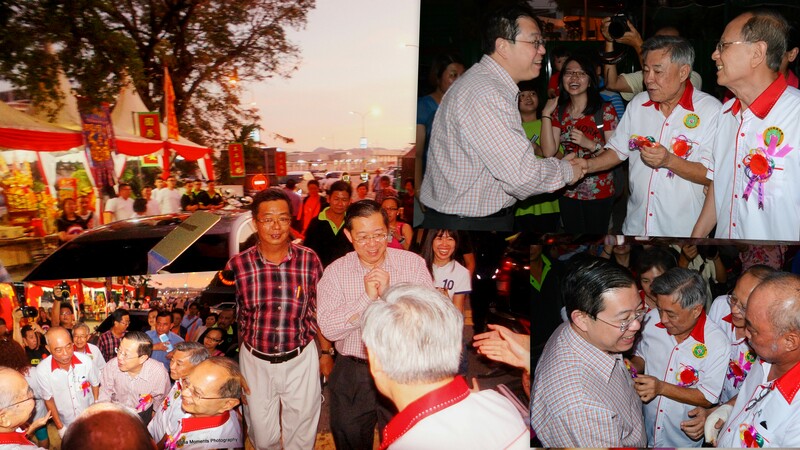 Tuan Lim Guan Eng. 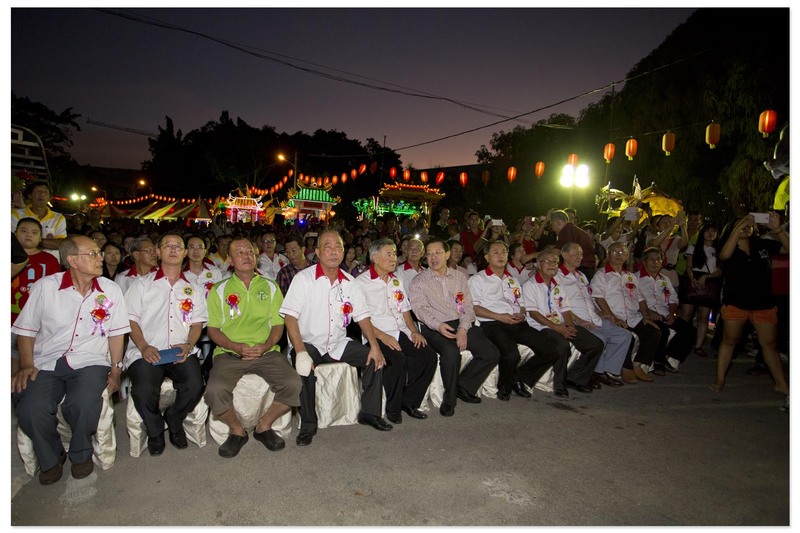 Guest of Honour, Y.A.B. 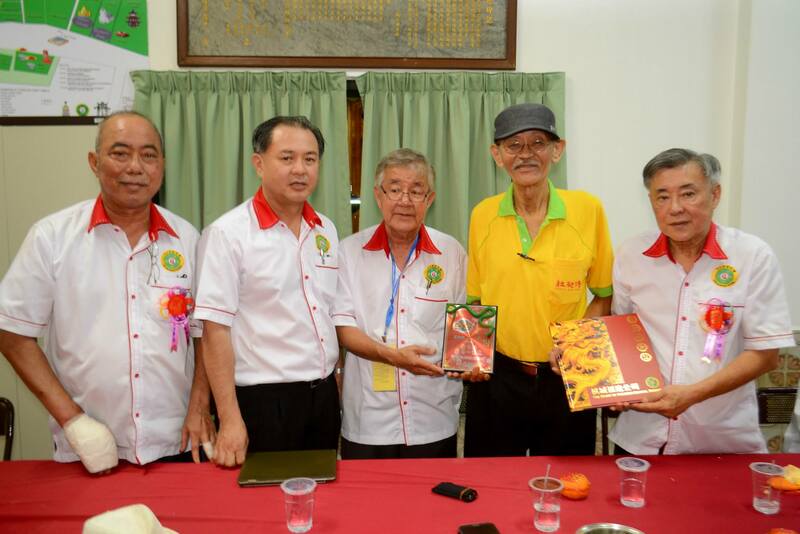 Tuan Lim Guan Eng being greeted upon arrival by Mr. Khoo Kay Hock, Chairman of Hokkien Kongsi, Penang and his fellow Trustees. 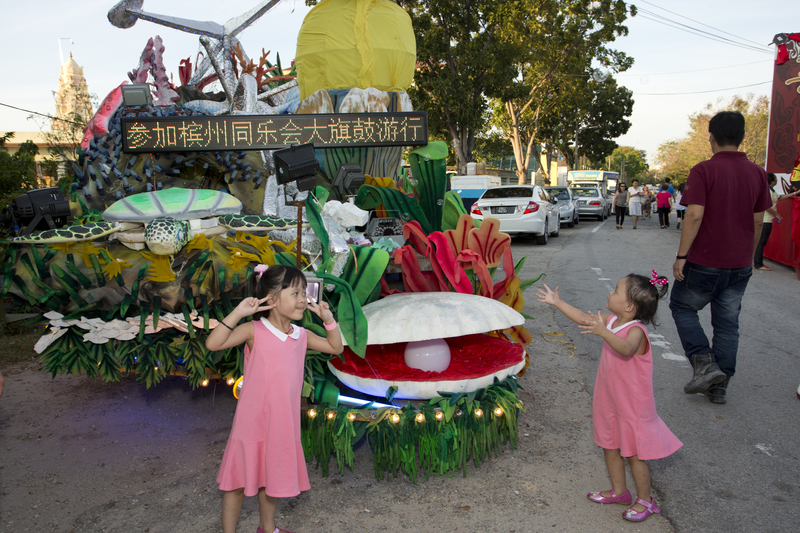 Y.A.B. 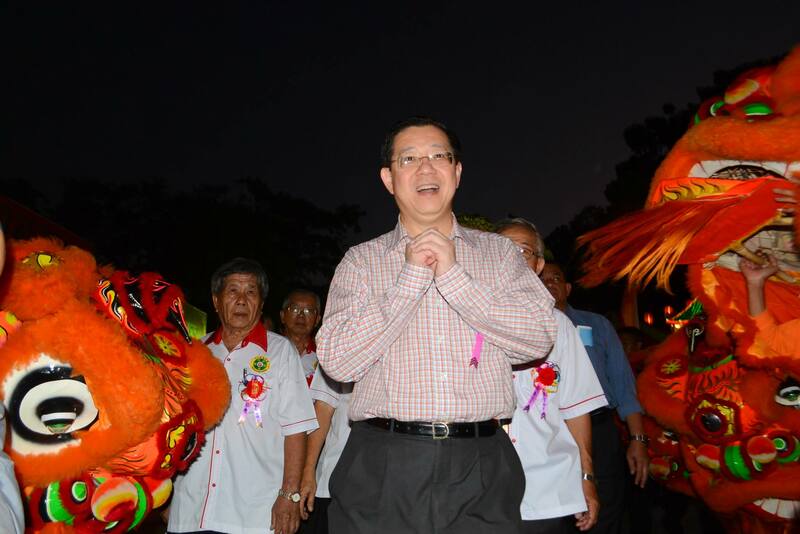 Tuan Lim Guan Eng wishing the crowd Gong Xi Fa Cai. After the first initital greetings, Y.A.B. 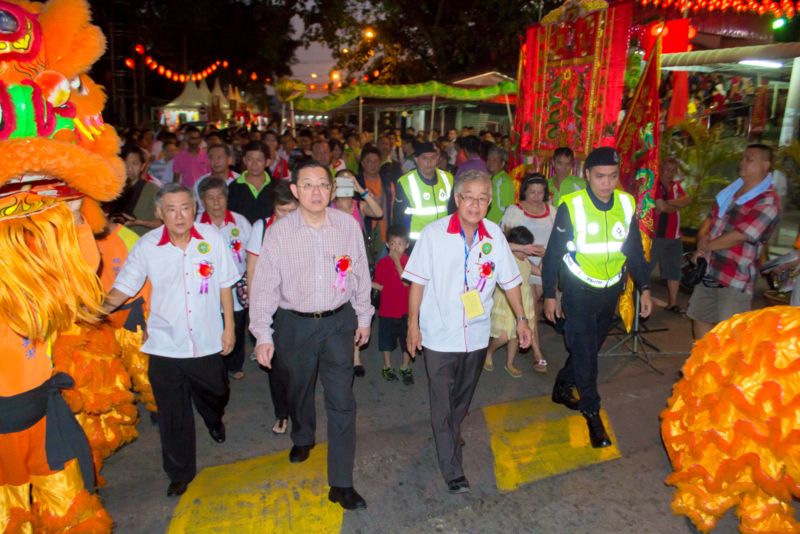 Tuan Lim Eng and company making their way to the Main Hall of Snake Temple to pay homage to Chor Soo Kong. Y.A.B. 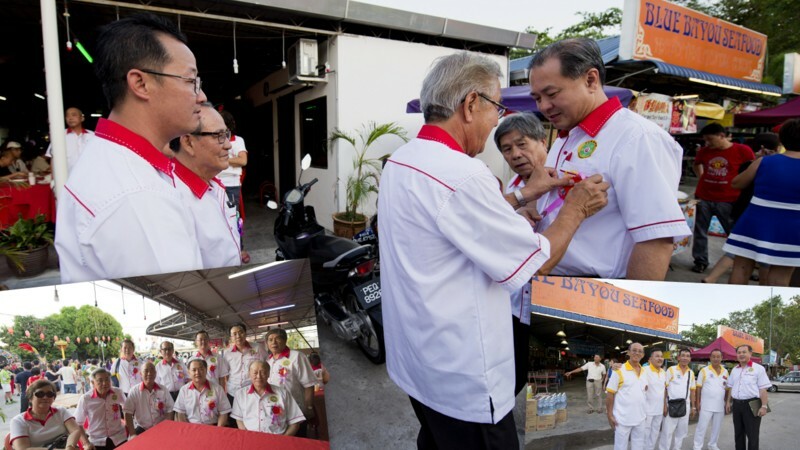 Tuan Lim Guan Eng, Y.B. 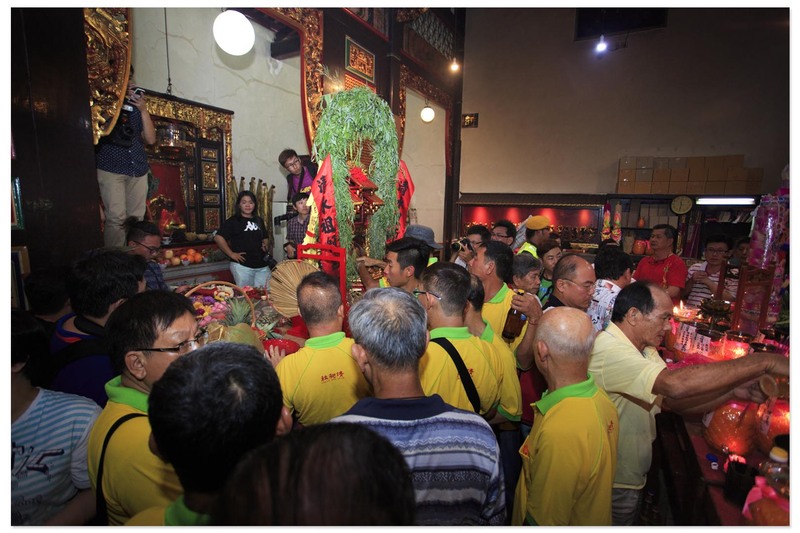 Danny Law, Trustees of Hokkien Kongsi, Penang and friends paying homage to Chor Soo Kong in the Main Hall of Snake Temple. Y.A.B. 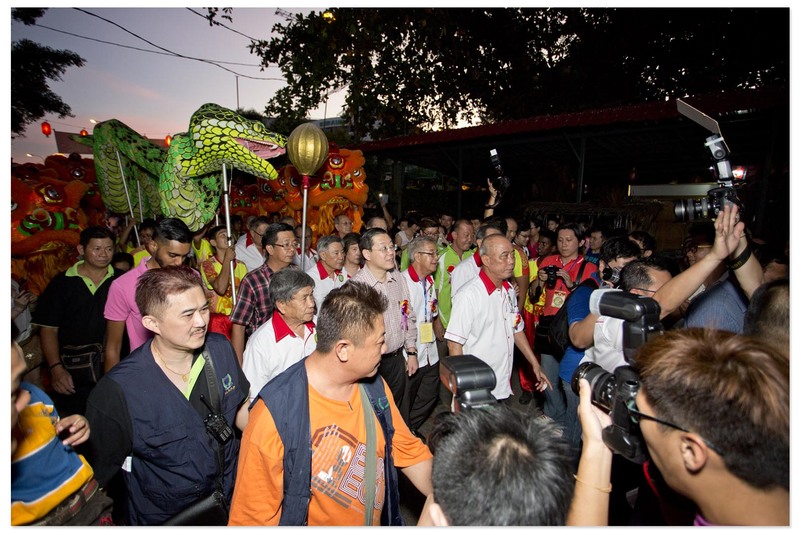 Tuan Lim Guan Eng accompanied by Khoo Kay Hock, Cheah Cheng Ean and Trustees of Hokkien Kongsi, Penang making their way to the Stage Area for the Official Opening Ceremony of Ban Ka Lan Festival 2015. 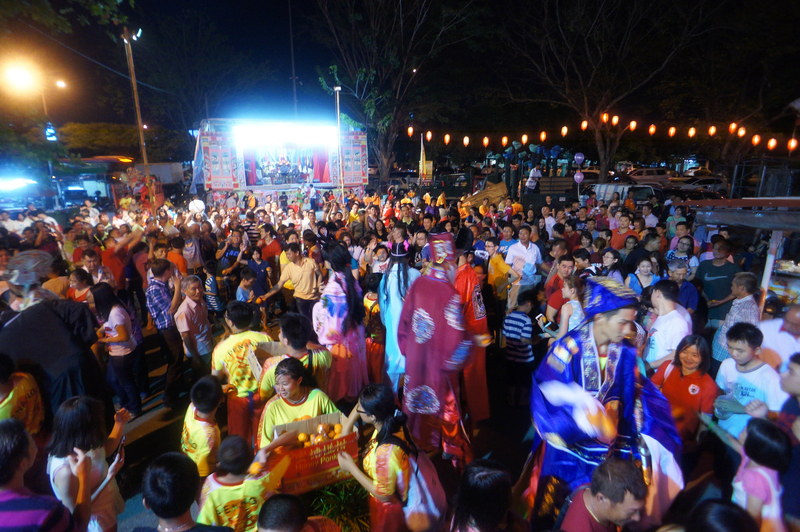 The official Opening Ceremony of the Ban Ka Lan Festival 2015 was about to commence. 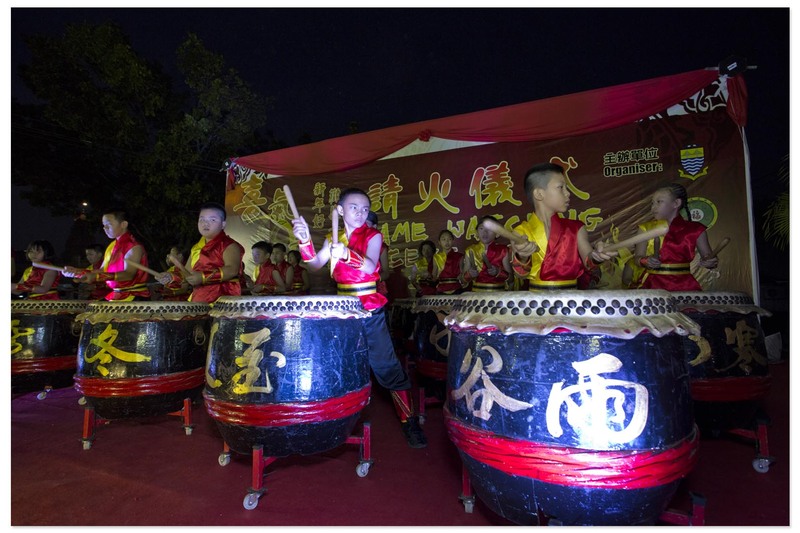 24 Drums Performance starting the Official Ceremony. 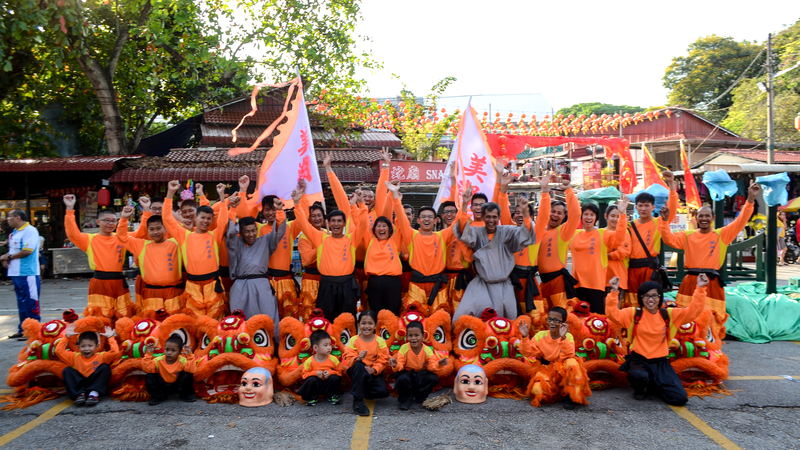 Snake Temple’s mascot doing the Snake Dance to welcome the spectators. Y.B. 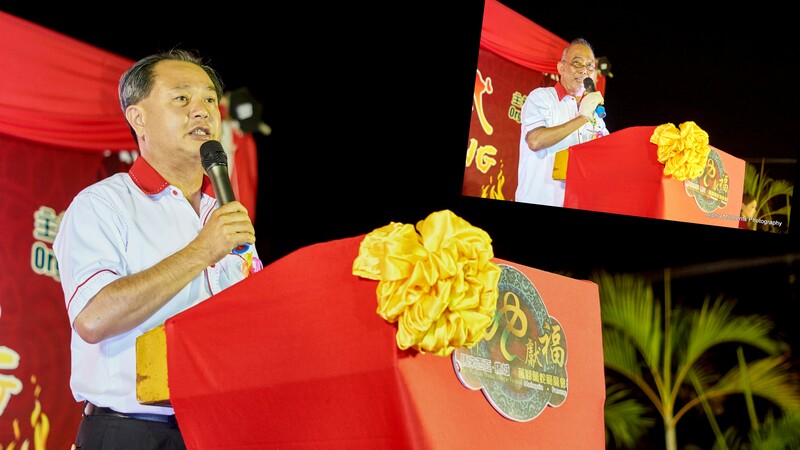 Danny Law Heng Kiang giving his speech. 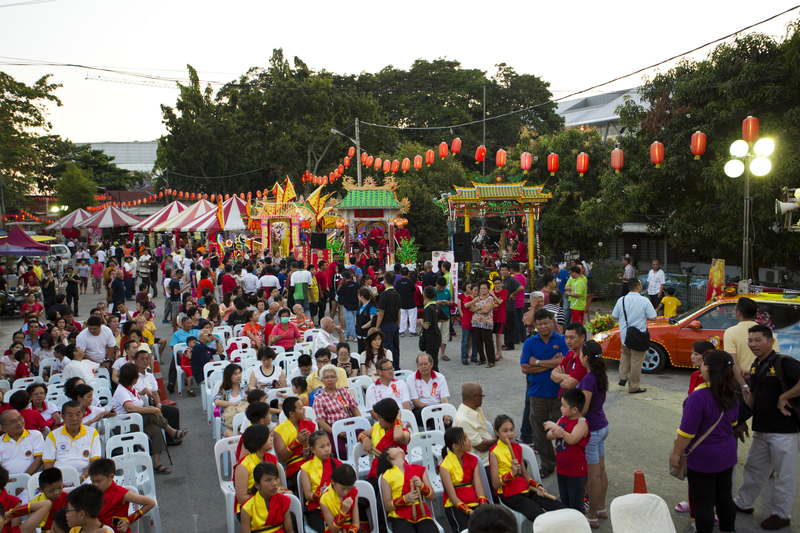 Inset photo, Tan Lye Hock delivering his speech. Y.A.B. 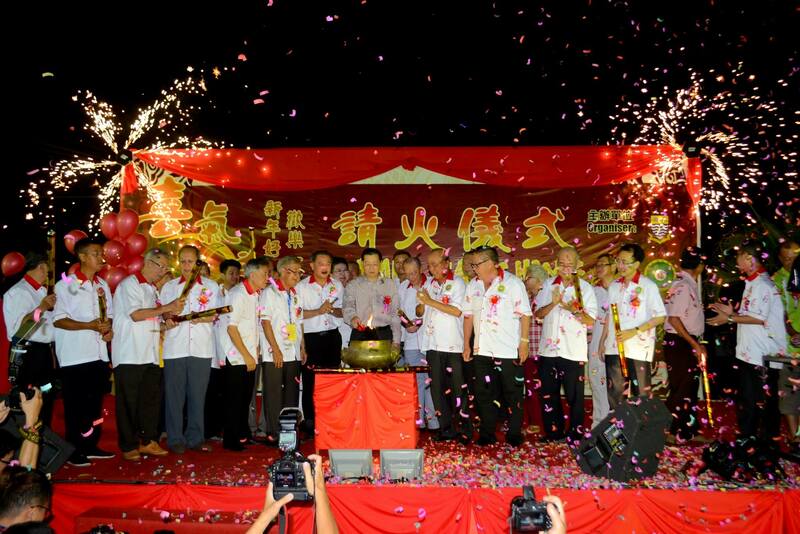 Tuan Lim Guan Eng giving his speech. 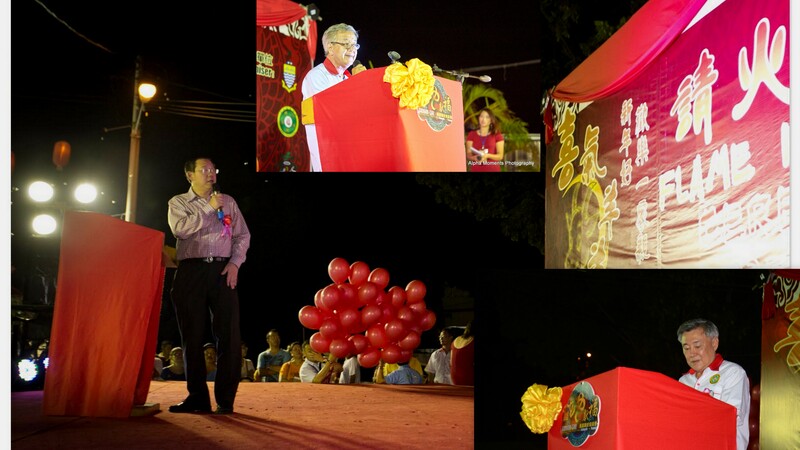 Inset photos (top) Mr. Cheah Cheng Ean and (right) Mr. Khoo Kay Hock delivering their speeches. 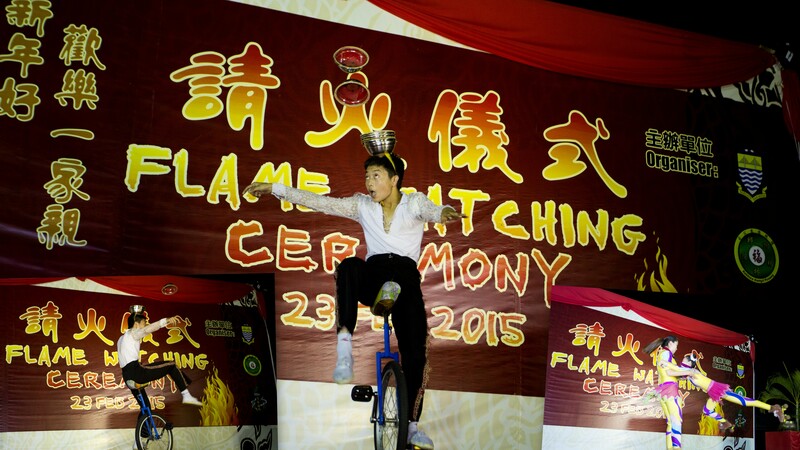 Official Opening Ceremony – let the fun begin. 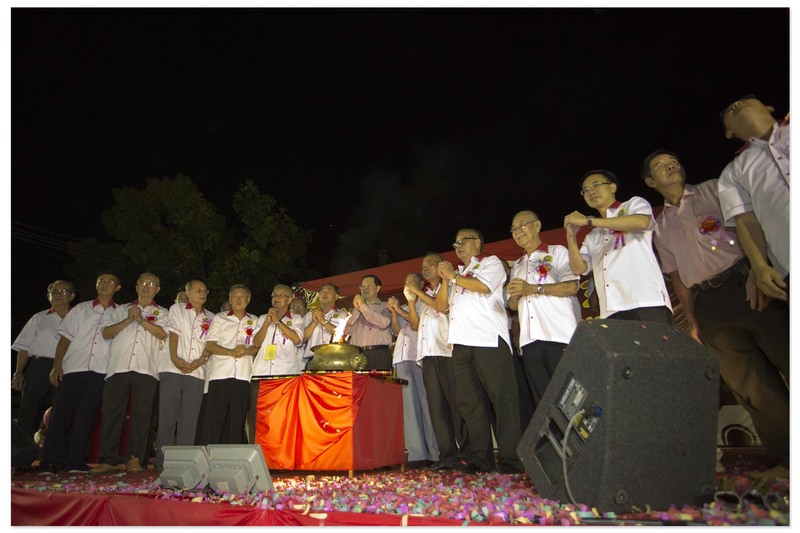 Lighting of the Flame of the Ban Ka Lan Festival 2015 by Y.A.B. 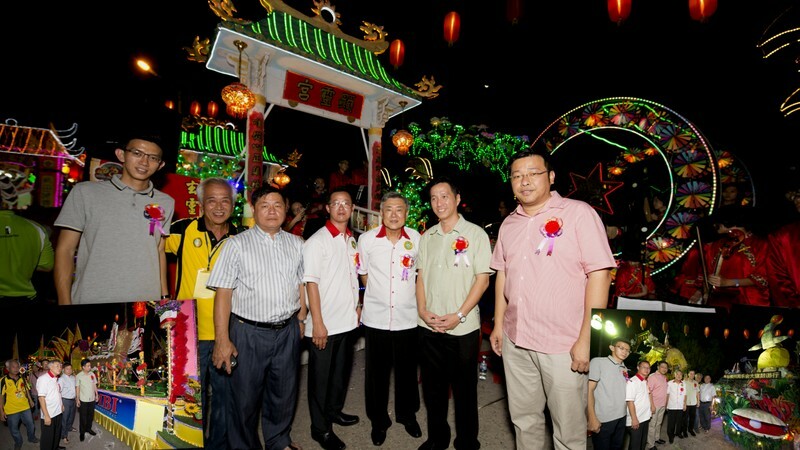 Tuan Lim Guan Eng. 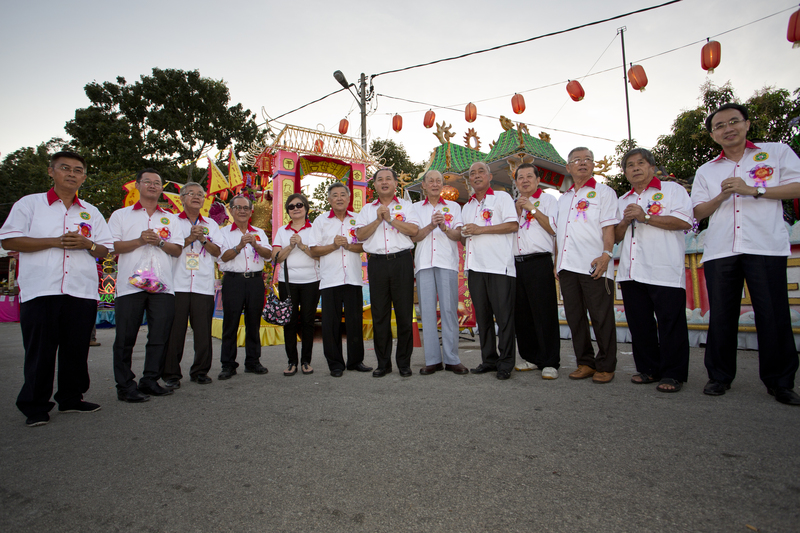 Gong Xi Fa Cai to all of you from the Penang State Government, Hokkien Kongsi, Penang and Ban Ka Lan Festival Committee. 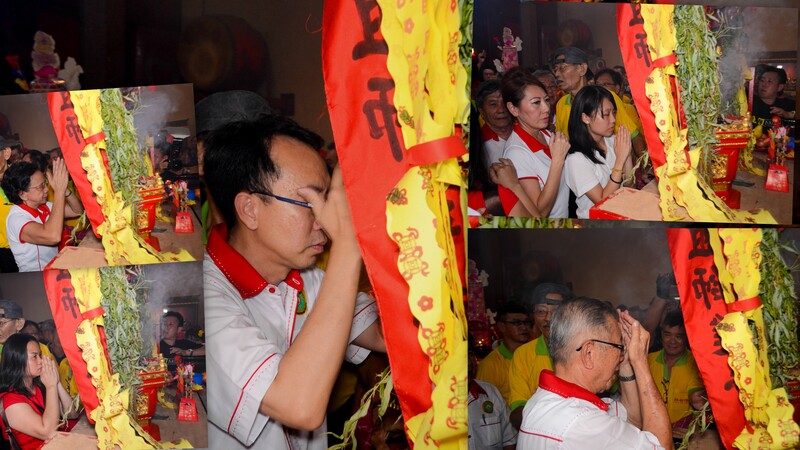 Prayers led by Sai Kong Moh Eng before the “Chneah Hoay” Ceremony. 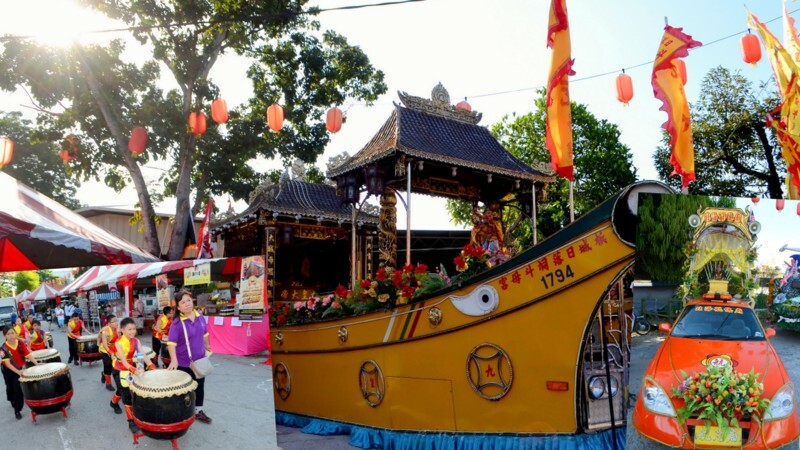 Preparing the “Chneah Hoay” (Flame Watching Ceremony) by Cheng Hoe Seah at 11.30 p.m.
Actual “Chneah Hoay” Ceremony to forecast the economy of Penang. 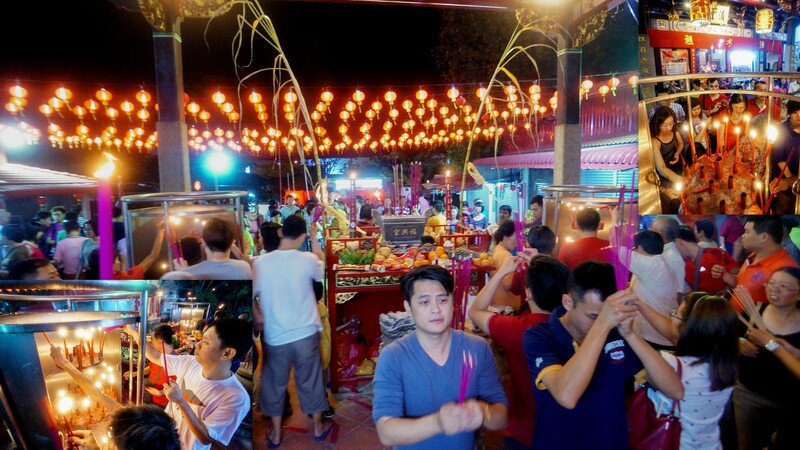 First 4 months – Good; Second 4 months – Normal; and Third 4 months – Very Good. 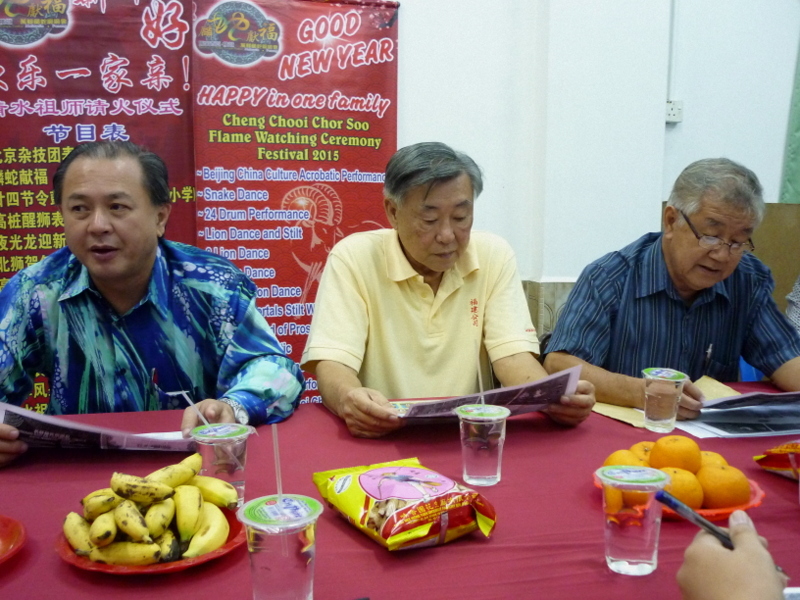 Press Conference after “Chneah Hoay” Ceremony to inform the public of the Economy Forecast for Penang. 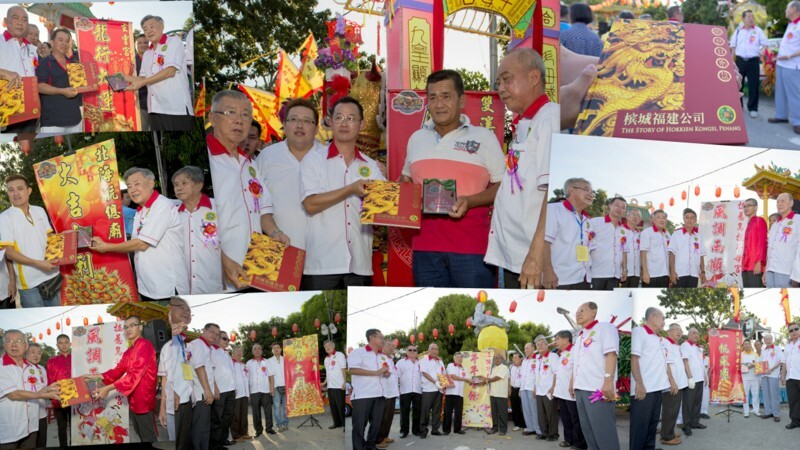 Presenting The Story of Hokkien Kongsi, Penang and a plaque to the Master of the “Chneah Hoay” Ceremony, Mr. Yeoh Chin Eng of Cheng Hoe Seah. 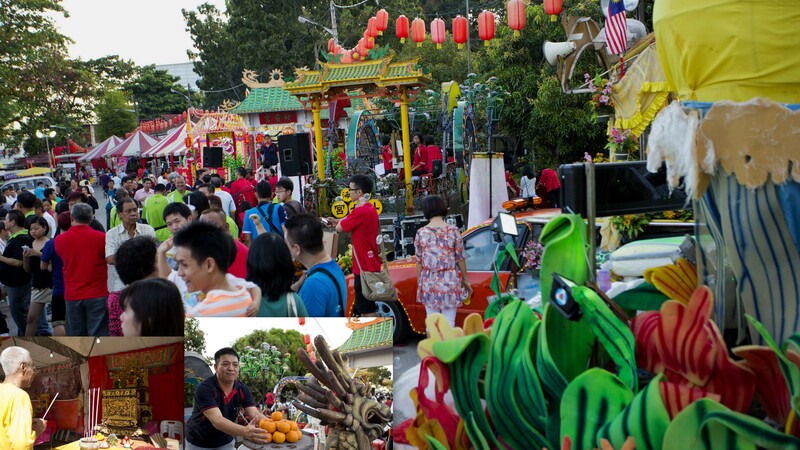 Adieu till next year. 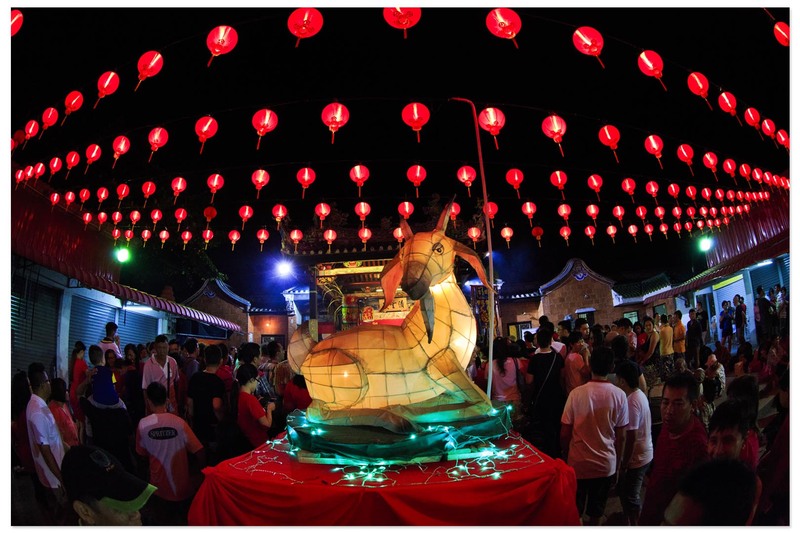 With best wishes for a healthy, lucky, successful and prosperous Chinese New Year from Hokkien Kongsi, Penang. 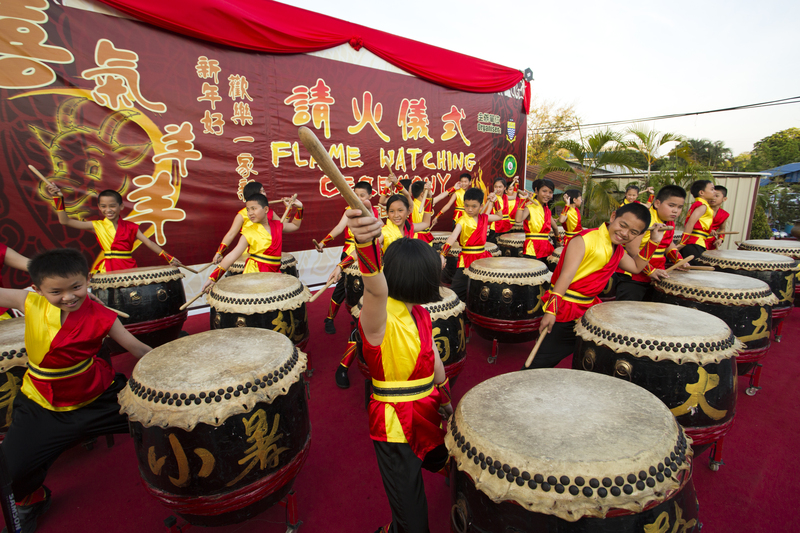 “Heng Arrh…Ong Arrh…Huat Arrh” (quoting Y.A.B. 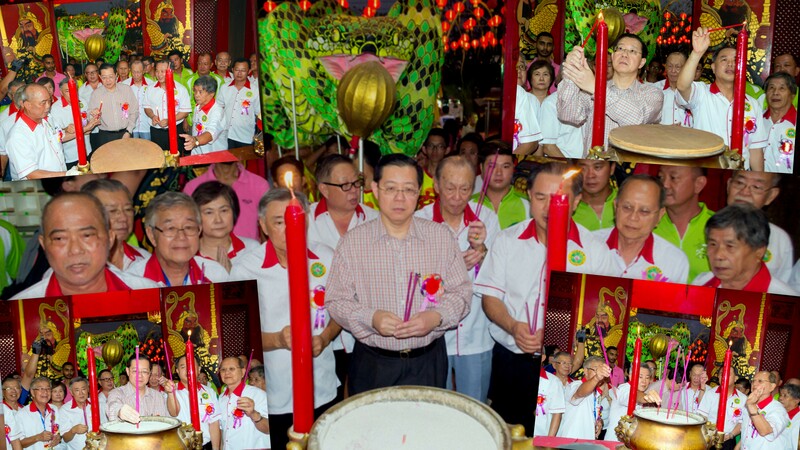 Tuan Lim Guan Eng). 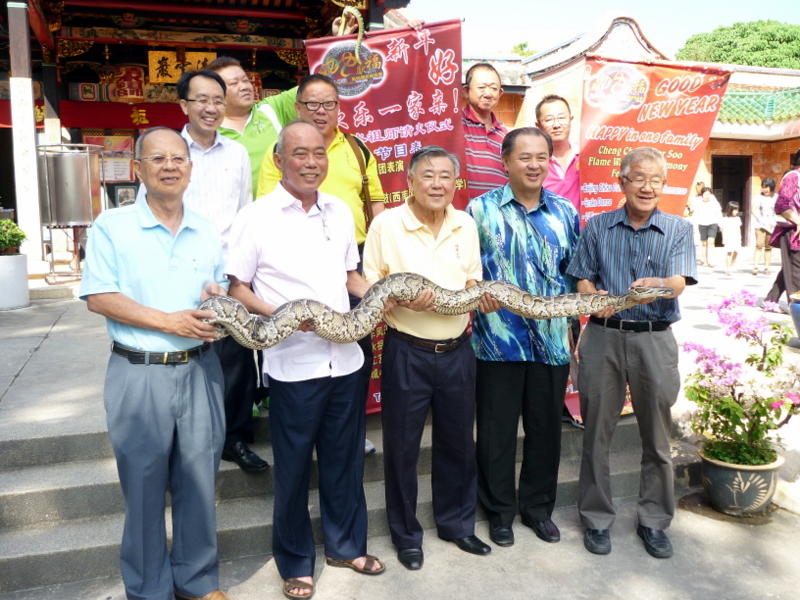 A press conference was held at 10.00 a.m. on Sunday, 8th February 2015 in the Conference Room of Hokkien Kongsi, Penang at Snake Temple chaired by Y.B. 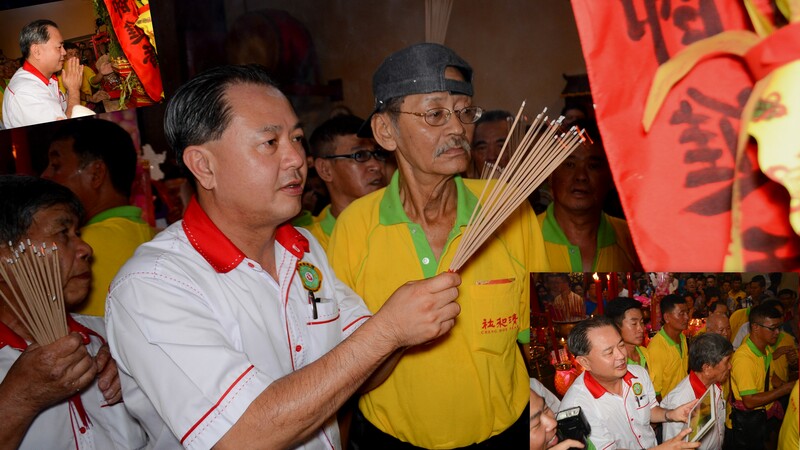 Tuan Danny Law and attended by Mr. Khoo Kay Hock, Chairman of Hokkien Kongsi, Penang and Mr. Cheah Cheng Ean, Chairman of the Organising Committee of the Ban Ka Lan Snake Temple Annual Flame Watching Ceremony. 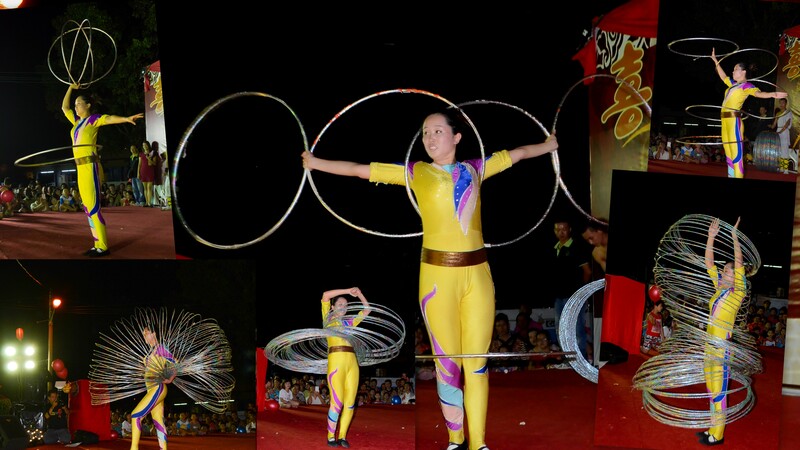 Press members were briefed on the programe for the evening. Press Conference chaired by Y.B. 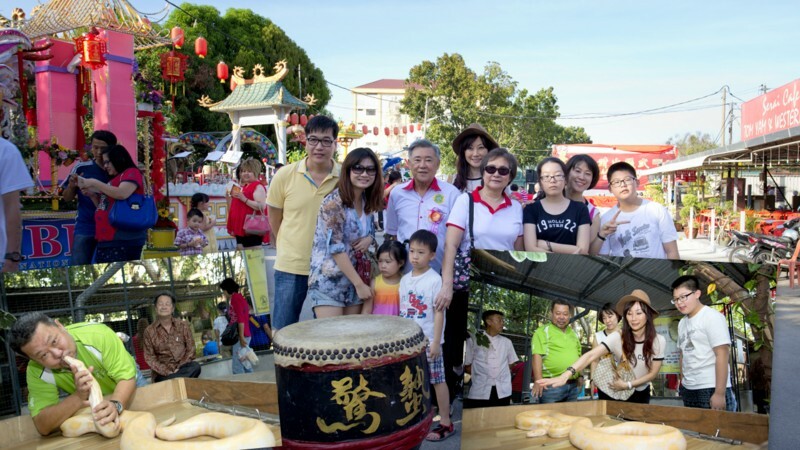 Danny Law, Minister for Penang State Tourism Development & Culture. 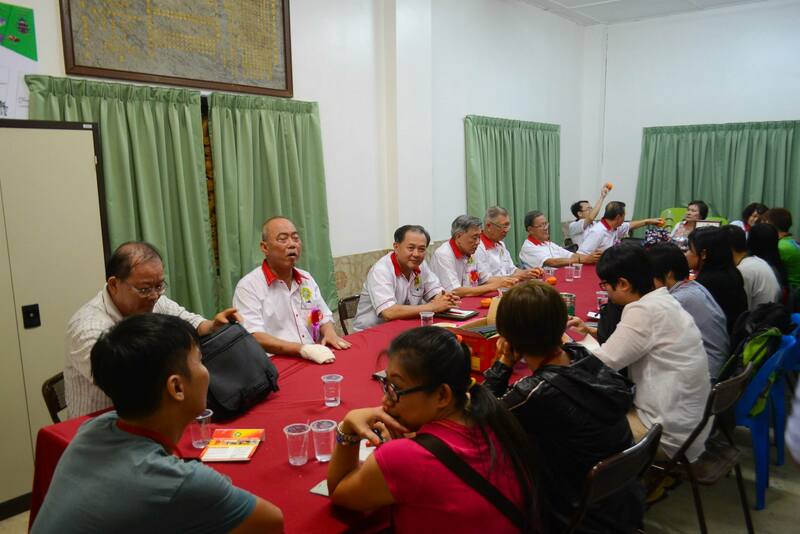 Press Conference attended by Trustees of Hokkien Kongsi, Penang; Members of the Organising Committee and press members. 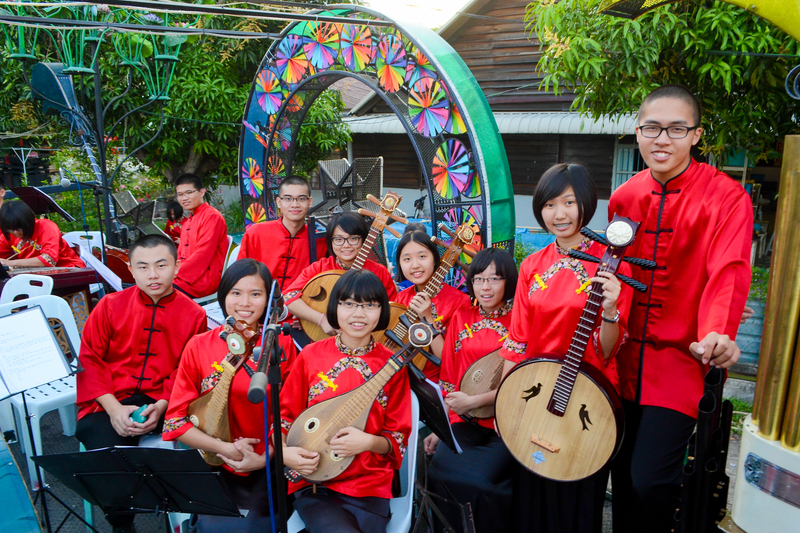 Group Photo after Press Conference.